With 3 off-the-shelf available pin fin coolers, all aiming at industrial or horticulture lighting projects, we offer the most comprehensive range of standard LED engines ever developed. 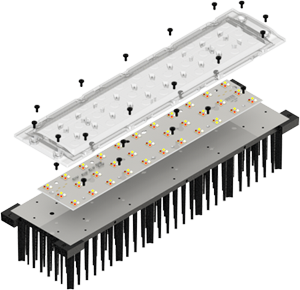 What makes the CoolBlock® LED Coolers so ideal for industrial, horticulture and floriculture top light projects. 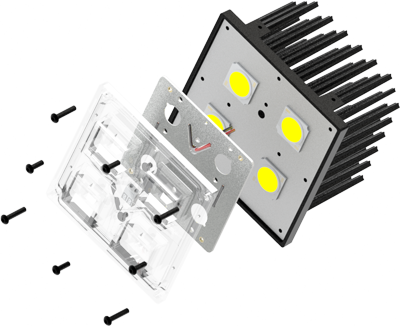 The CoolBlock® LED Coolers are always developed in conjunction with existing optics which fit the use in industrial or horticulture applications. Special beam angles are available in these lenses, like beam shapes for street lighting, flood light or batwing lenses for horticulture projects. All CoolBlock® models are foreseen from an e-coating finish, what makes them perfect resistant to sulfides, UV, acids and other materials often seen in these environments. With its square appearance in a size of just 96x96mm, this cooler goes along with the Ledil 2x2MX lenses (available in PMMA and Silicon). In each lens pocket you can place a high power white LED up to 10 watts, up to 4 high power horti LED packages, or 4 individual COBs. With a thermal resistance Rth of 1.45K/W one individual cooler can handle up to 6.000 lumen of white light or 65 watts of horti LEDs, equivalent to 160μmol/s. ▲ CoolBlock® SQ-01 2x2MX mounts with Citizen CitiLED CLU028, CoolConnect® holder 2X2MX and Ledil lens. A wide variety of CoolBeam® assembly kits have been made available for this CoolBlock® 2x2MX, which allow you an easy project approach without any additional tooling requirements. As the name says it, this cooler goes along with the most industrialized waterproof lens, the 2x6 array (available by Ledil Khatod,…). 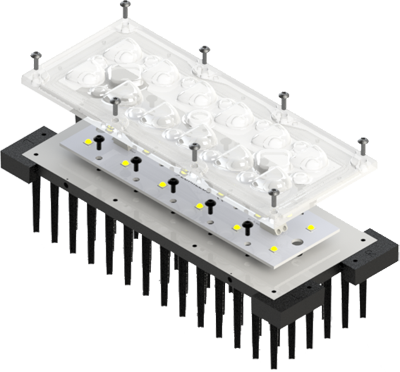 So 12 individual white high power LEDs or horti LED emitters are placed on a board to go along with it. With a size of just 20x8cm and a cooling performance of 1.05K/W, this cooler can go all the way up to 6.000 lumen or 80 watts-200μmol/s in the horti spectrum. ▲ CoolBlock® LX-01-2x6 mounts with Lumileds Luxeon XR-TX and Ledil Strada IP 2x6 lens. The CoolBlock® LX 2x6 is also super simple extendable with the CoolConnect® Inter screws. In this way you can extend your array endless in the width, what makes it the ideal platform for top lighting projects like high bays or aquaria lighting. This is the most performant pin fin LED cooler made in these LED engines. The cooler goes together with the Ledil Florence 3x11 and the Ledil Floral (launch Q1 2018) and is co-developed with Osram OS, Ledil and Cezos. With just one CoolBlock®, full passive, size 34x10cm (so yes a very limited shade footprint), you go as high as 750μmol/s!! Also as a high bay light or an industrial flood light, this cooler offers the perfect platform up to 22.000 lumen from a single unit.